Eating in Season….Roasted Beet Chips, Kohlabi (huh? ), and breakfast! Every week our local CSA updates their blog a day or two before pick up so that we know what goodies are coming and plan out how exactly we’re going to eat up all the deliciousness that is local farmed goodness. This is prime veggie season and every week our full share is bursting with color as we munch our way through vegetables that we’re familiar with and those we’ve never heard of before. It’s fun (an somewhat challenging) to research different recipes and step out of our own food comfort zones to try things that for the most part we’ve really come to enjoy. Not everything we make is complex. Don’t get us wrong, Tara really likes to roll of her shirt sleeves, put on her most manly apron and tackle something that requires time. But there are just some days you don’t want to really think too much about what’s going into the pot in order to put something into your tummy. Now if you’re getting your beets from a local farmer’s market you’ll probably be dealing with the beet greens still attached. DON’T THROW THEM AWAY. It may seem counter intuitive but the greens of the beets are really good for you and contrary to popular belief, really tasty. We use them in stir fry or with sauteed veggies. We are also starting to use them in smoothies as a change up from spinach. If you don’t have a mandolin handy it might be a little difficult to slice by hand but it can be done (as Tara will attest too). A hand held mandolin can usually be found for around $20 and will be an invaluable tool in your kitchen! That being said, if you are cutting by hand it’s easier to use a serrated knife (but seriously just go get a hand held mandolin). Slice your beets about 1/16th of an inch thick and toss with coconut oil or olive oil. Start with just 1/2 tsp and use your best judgement from there. Our beets were on the larger size of medium so we used a full tsp. Because we’re only making meals for the two of us, you’ll need to adjust how much you’re using according to how many you’re feeding. A good rule of thumb is too double what you need if you are feeding three or more. And hey if you have too much in the end you can always just keep the leftovers for the next day or for a quick go to snack! The Kholrabi looks a lot like a head of red cabbage but when you slice into it, it will have the consistency of an apple. Light and refreshing you could just slice this beauty up and eat it raw (as we have done). Take the slices and julienne in the same manner as the apple. 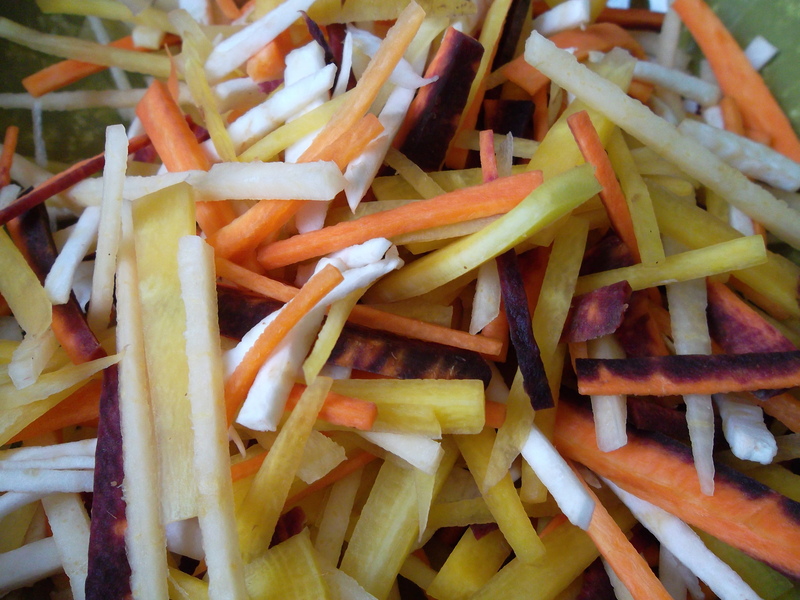 Peel and julienne the carrots then in medium bowl toss apple, kholrabi and carrot together. Squeeze fresh lemon juice over the mixture (both for taste and too keep the apple from browning) and serve! The other night we were having dinner with a friend and we started talking about easy breakfast recipes. We asked if she had ever tried baking an egg in an avocado before and she said she had not. It got us thinking about how sometimes you skip breakfast because you think you don’t have time and then by the time lunch comes around you’re so ravenous you’re heading for the nearest McDonald’s to appease the hunger monster…This recipe is not only so simple anyone can do it (seriously anyone) but it’s a switch from the cereals or breakfast bars you might grab on the go and it’s so freaking good for you. It seems weird to crack a raw egg into an avocado and bake the entire thing. The first time we did this it didn’t turn out as pretty as we were hoping for but it was really good and so we’re sharing this recipe even though the pictures are kind of so-so. The nice thing about this is you can pop them in the oven and run off to take your shower while it cooks and when it’s done just eat it right from the shell (Look Ma! No dishes!). After you cut your avocado and remove the pit, crack one egg into each. The first time we made this we separated the yolk from the whites (to make sure they would fit) then added enough egg white fill the center. In hindsight we think it would be really good just to crack the entire egg over the avocado (making sure the yolk stays in the middle) but letting the egg white cover the entire top! You can see that the yolk on the right doesn’t quite fit. Place into oven and bake for about 20 minutes or until eggs are cooked to your desire. When we removed them from the oven the yolk that didn’t quite fit was cooked much more thoroughly but they were both really tasty. Garnish with some salt/pepper or your favorite seasoning and stick a spoon in those babies! We are down to seven weeks on our CSA! This week we’re expecting kale, summer squash, tomatoes, beets, celery and a few other goodies. We might dedicate an entire post to making smoothies cause most of these morsels (minus the squash and a few other items) will be going into the blender then down the gullet for sure! CSA week 2: Summer salads and dessert! The strawberries were to die for and didn’t last long in our house (and by didn’t last long we mean they lasted approximately 3.2 minutes). We have the option of swapping items out when there is something in our share that we more than likely won’t use and for this particular week we swapped out the cilantro. We opted to grab an extra bunch of turnips and see what we could come up with. Summer is finally upon us so wanting to spend hours cooking in the hot kitchen is less than desirable (unless of course you’re making desserts!) so we are using our CSA goodness to make some pretty amazing salads as you’ll find below. There won’t be any back links to original recipes because we pretty much just took some veggies, cut them up and used lime to enhance the flavor of the vegetables. No extra dressing required. Cut avocado in half and remove the pit. You can either scoop out the halved avocado and cut it into bite size pieces or if your like us (read: don’t like to make more of a mess than necessary), you can cut the avocado into pieces right in the shell and then scoop into bowl. Remember to keep the shell so that you can use it as a decorative dish (read: less mess to clean up!). Gently scoop both halves into bowl. Cut, chop, chunk onion, cucumber and tomatoes and mix. Be gentle so that you don’t squish the avocado. Squeeze lime juice over the mixture and scoop back into avocado shells. If your lime is a little hard (as most limes are) here’s a little tip: Before you cut it open, roll it around on the counter while pushing down to loosen up the pulp. Here’s where you get to put your knife skills to work. The carrots we just peeled the outer layer of skin off then continued to peel so that we got nice thin slices without having that “carrot salad” cut to it. Makes it that much more fancy and looks like you know what you’re doing in the kitchen! The turnips / cucumber we sliced using a hand held mandolin then went one step further and sliced them into strips. Squeeze fresh lime over veggies and mix it all together! In a glass baking dish, mix rhubarb, strawberries, 1 Tbsp honey, 1 Tbsp coconut oil and 1 Tsp vanilla. Coat fruit well then pop into oven for about 20 – 25 minutes. The rhubarb will get soft and everything will become almost jam like when you stir together (break up rhubarb with fork if needed). It was after everything cooked together that we discovered the topping to be too tart for our liking and added the 1/4 C of raw cane sugar. This is purely optional since you might like it more tart or even more sweet than we do. While the fruit baking get to working on that delicious nutty crust! In food processor, pulse nuts until they break down into very small pieces (the nuts will start to cling to the side). Add the rest of the crust ingredients (including egg white) and continue to pulse until you get almost a dough like consistency. Side note: The crust was amazingly good. So much so we think it would make an excellent snack option as well. Either mixed without the coconut and rolled into balls then coated with shredded coconut or just all mixed together as is and made into little bite size balls. Once everything is all mixed together, press 1 Tbsp of mixture into lined cupcake /muffin tin. The original recipe said it would make 10 and it did but after everything was said and done we think we could have easily made 12-14. The mixture will be very sticky so have bowl of warm water for fingertips to help press mixture into tin. When rhubarb is cooked thoroughly remove from oven and break up the fruit until you get a jam like consistency (this is where you would add the sugar if needed). Remember it’s freaking HOT so be careful if you are tasting for tartness. Pour mixture into another bowl and let cool for a few minutes (2 – 3 ish). Add whisked egg white and mix well. Spoon filling into each muffin tin evenly (this is where we realized we could have made 12 – 14) but not over full as the mixture will boil up a little as it continues to cook. Pop back into oven for another 25 – 30 minutes. These turned out pretty freaking amazing. There is a lot of things you can do with them once they are cooked. Melt a little dark chocolate or add a little coconut milk topping. Add pineapple chunks or a little frozen banana paleo ice cream for delicious “pie ala mode”…However you eat them they are going to be good! This week’s CSA is full of veggies and something neither of us have tried before: Garlic Scapes which we both found very good (think scallion but with garlic taste). We experimented with a carrot ginger dressing and it turned out pretty amazing! We can’t wait to make yummy salads this week! It’s easy to throw together a full meal in a pot. Take a few ingredients, add some spices and throw it all on the stove and voila! Okay maybe it’s not that easy but we’ve been cooking up a lot of 1 pot (or pan) meals lately and today decided to post two sides that were popular in the HDD’s house (meaning: We ate it all). 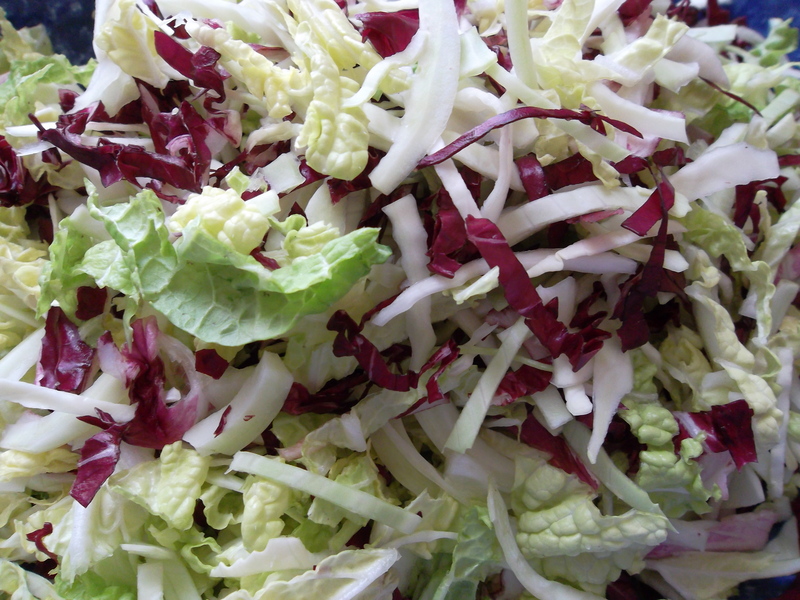 The first is a wintery coleslaw that we came across at this website, when looking for a recipe for the Spanish radish we picked up at the farmer’s market. Unfortunately when Tara went to use the radish she realized it had “matured” beyond its use. However with a few changes the coleslaw was delish! If you think coleslaws are only for the warm months, give this side a try and think again. The second recipe is originally from the CheapHealthyGood blog. 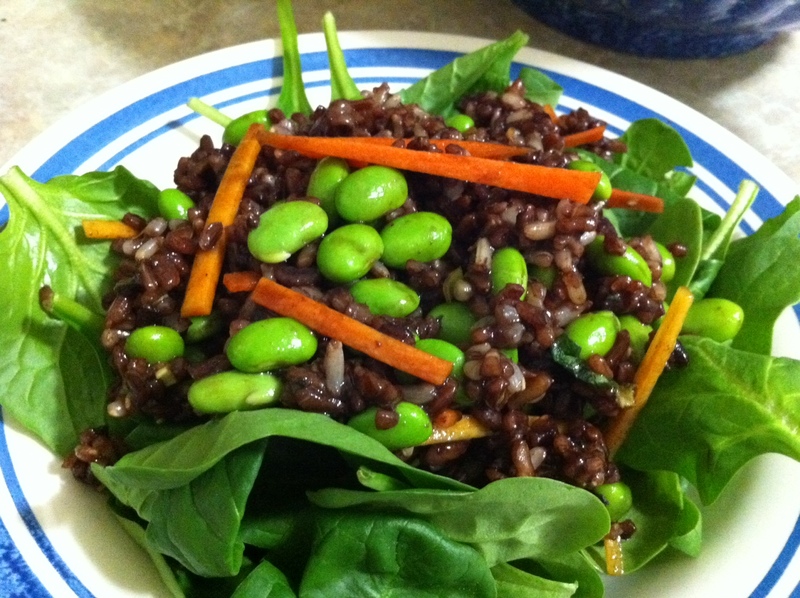 As the website shows this is a wild rice salad but the wild rice (with edamame) was so tasty alone we used it as a side multiple times in lunches. Not a whole lot of thought in this part. Here’s a good chance to practice your knife skills. 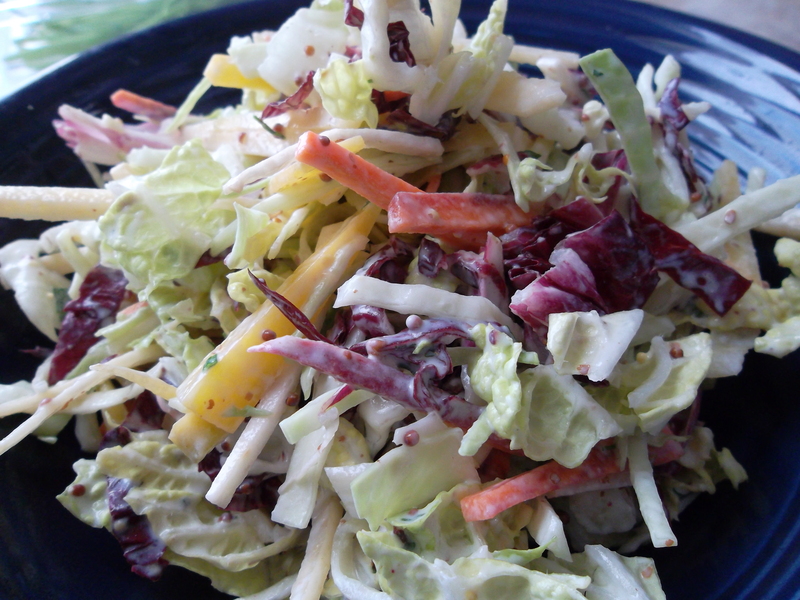 Put the cabbage and veggies mix into a bowl and move onto the dressing. Extra virgin olive oil (about 1 Tbsp). 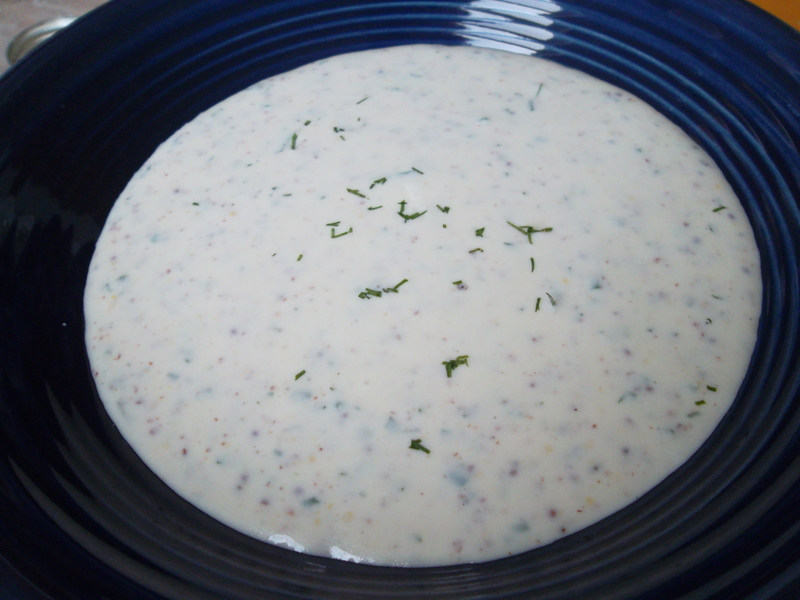 In a medium-sized bowl add fresh juice from squeezed lemon (make sure to remove the seeds! 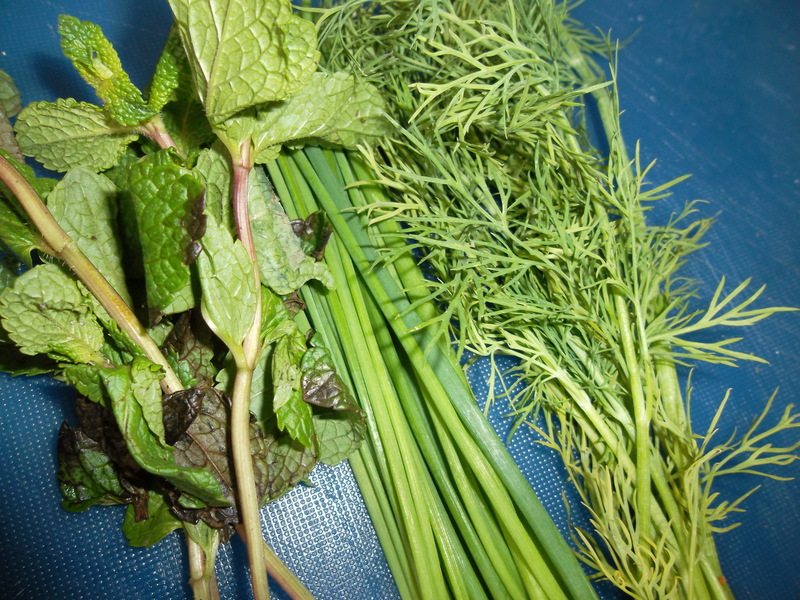 ), olive oil, yogurt, mustard and fresh herbs (another good opportunity to practice your knife skills). Mix well and adjust to taste. If you’d like to add salt and pepper for taste this is a good time to do that but we found we didn’t need to add either. Pour dressing over cabbage / vegetables and mix well. – Side note: this coleslaw has a lot of opportunity for changes. Over the course of a few days we tried it with cranberries, flax seed and almonds. Something sweet works well with the tangy dressing. Use your imagination and let us know what you come up with! Cook the rice and bring to room temperature. Mix fresh squeezed lemon juice (remove any seeds), mint, olive oil. Pour dressing over rice / edamame / carrot mix.